Combines the safety of a bed rail with the luxury of a bedside tray. Features an ergonomic handle that offers assistance while standing, prevents nighttime falls and comes with a luxury tray that swivels 360° and out of the way when not in use. 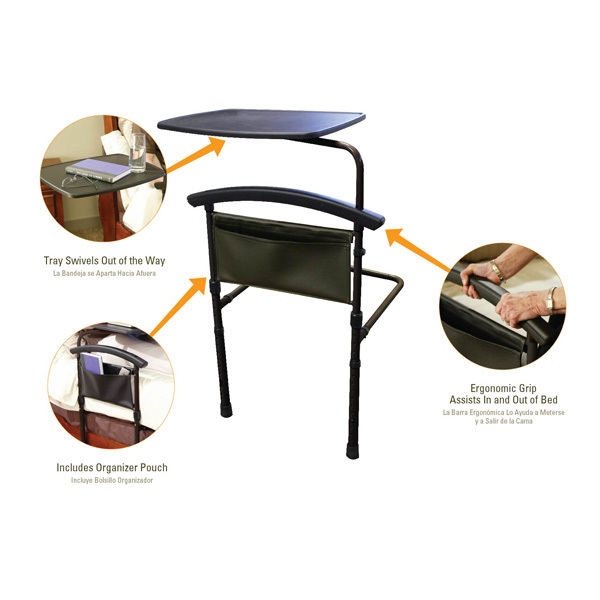 The legs on the Independence Bed Table extend to the ground for extra stability and the leather organizer can keep books, medications or glasses close by. Attractive low profile design matches the look and feel of any home. Made of steel frame with a durable powder coat finish. Height adjustment of 21" to 44" (53 to 112cm) from floor to top of handle accommodate any home or hospital bed. Height adjustment from mattress base to top of handle is 17-1/4" to 22-1/2" (44 to 57cm) and rail width is 19" (48cm). Depth of horizontal support structure under the mattress is 25" (64cm). Weight capacity of rail 300 lbs. (136kg) and weight capacity of the tray is 30 lbs. (14kg). Easy to install in minutes with no tools required.